New Year’s Luck Traditions. Watch luck come pouring in all shapes, sizes, and meanings. The last Day of the year in Germany is celebrated with New Year’s Luck Traditions. When the clock strikes midnight, it’s a brand new year. Fireworks color the sky and people fill the streets. Yes, New Year’s in Germany is quite a celebration. After the echoes of the church bells have subsided, people return home for “Bleigiessen.” (AKA: Lead pouring for prophecy and prediction.) Over a burning candle, a small amount of lead is melted in a spoon. When the metal liquifies, it is poured into a bowl of cold water and immediately a shape is formed. How these shapes are interpreted will determine the future, so the story goes. Go ahead, hold it up to the light with a fork or tweezers. What does its shadow reveal? An island means a dream will come true. A heart stands for happiness, health, and peace. A nest? That represents luck within the family. Curious to know all various shapes and meanings? Click here. Good luck to you. Melting lead doesn’t reveal the entire future. And who couldn’t use a little extra luck on their side? That’s where the Gluecksbringer comes in. These good luck charms are popular in Germany—and some are recognized the world over. Legend has it, Eve took a four-leaf clover out of the Garden of Eden. If you ever find one, congrats! You just got a little piece of paradise. These little messengers from heaven are said to protect children and the sick. Catch one if you can! A symbol of prosperity and health. Always hang your horseshoe, so that it hangs like a “U” and the luck can fall in. If you hang it upside down, you’re good fortune will fall out. Seeing or coming in contact with a chimney sweeper is considered good luck. Back in the day, without electricity or gas, the men in the top hats were responsible for helping to keep those old fashioned ovens running so that meals could be prepared. Serving Lentil Soup on New Year’s Eve will ensure you don’t run out of pennies in the coming year. To find the recipe click here. You have 364 days to wash your clothes. Just don’t do it on New Year’s Eve! 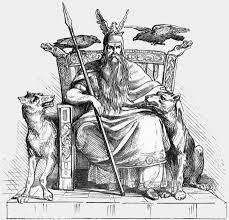 As the story goes, Wotan (or Odin) a major deity in Germanic and Nordic mythology, rides with his cohorts on the night of New Year’s Eve and nothing upsets the gods like getting caught up in your hanging laundry. So clear those clothing lines and maybe, just maybe, you’ll be blessed with good fortune for the rest of the year. You might like the one or the other of the German New Year’s luck Traditions. Add the right food to the table and find here traditional recipes for your party on New Year’s Eve.